Thank you for your interest in ACE AudioVideo Consulting & Engineering. ACE is a firm dedicated to providing for the entertainment needs of today and tomorrow. 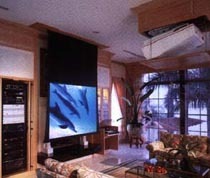 AudioVideo products for home entertainment and commercial systems. Whether you need a television or a Theater, a new pair of speakers or sound throughout the office or home, ACE researches products to match your requirements. With hundreds of name brands available, why limit yourself to what's on hand at local retailers? ACE will supply what you want and need without the hassle. Consulting services to homeowners, designers, builders, and architects to ensure integration of entertainment and architecture. Today's electronics can be confusing to those not directly involved in the industry. ACE provides a necessary service to the end-user by educating them on the proper use of their equipment and providing a custom owner's manual if needed. Engineering and installation of systems that are easy to understand and use. In the most complex of systems, touch screens and automation controllers can be utilized to provide "one button" activation of sequences. In less complex applications, utilizing equipment that interfaces for ease of use and is intuitive allows for greater enjoyment and satisfaction. 30 years of industry experience have given me the necessary background in acoustics, aesthetics, operation and integration of today's home entertainment. High performance audio-visual systems are a pleasure to create and to enjoy. My commitment to customer satisfaction comes from years of retail and factory level marketing work. We are authorized dealers for numerous major brand name products and have industry and factory training certification in system design and installation of these products. My clients include local sports and media personalities, national media executives, developers, contractors and the international architectural firm Gutierrez-Cortina Arquitectos. Recent projects include Paradise Point Resorts' new fitness center and pool, Barefoot Bar & Grill, Baleen Room, Soboba Casino, Matthews/Mark advertising agency, Karl Strauss Brewery & Grill and many private individuals as well. I enjoy working for a variety of people, regardless of lifestyle or individual needs. It is my belief that by providing quality products, attentive service, and intelligent design at the level expected by the end-user, entertainment will truly be a pleasant experience. Thank you for considering ACE for your audio visual needs. I look forward to working with you.